Rocky Mount uses a continuous impingement tunnel oven and spiral freezer technologies. It also installed other cutting-edge equipment and automation for added efficiency. After baking, the delicate cakes are conveyed through a 3-stage cooling and freezing process, all employing IJ White’s Ultra Series Systems. The first stage consists of an Ultra Series Spiral Cooler designed to provide very gentle thermal changes in the cakes — taking out the latent heat and allowing the cake to begin to solidify and stabilize. “Gentle cooling is critical to prevent surface cracking,” Mr. Carango said. The second spiral cooler maintains reduced air temperatures. The goal here is to bring product’s core temperature down before entering the freezers. The supplier identified four critical process points or zones where the system individually controls the holding time, air flow pattern and temperature. Series 7000 Welded Floor System. This fully welded base is sloped to drain and can be gently heated to maintain a specific surface temperature. The heating system is controlled by PLC and has warning indicators should the temperature get too cold or too warm. The floor is made from 10-gauge stainless steel that along with the continuous seam prevents warping. The blast freezers bring the cakes down to a core temperature suitable for slicing. Cleaning and sanitizing was a priority for all suppliers, and belt washing systems were installed on each of the three plastic chain conveyors. Located inside the entrance of each chamber, the self-enclosed units fully cover a section of the belt, top and bottom. High-pressure water sprays from the top portion of the twinhead wash system onto and through the belt as it travels slowly along. Each wash head outputs hot water at 500 psi while rotating at 500 rpm. Water that sprays through the belt then hits deflector plates on the bottom portion of the wash unit and deflects onto the bottom of the belt, completely cleaning both surfaces. Water and product debris are directed to the floor drains. The 3-stage cleaning process includes washing, rinsing and sanitizing heads and an air blower at the end to dry the belt. Even the plastic belts used in the Ultra Series systems are unique. Each system features a patented automatic belt tensioning device that maintains uniform tension across the width and along the entire length of each segment of belting. It is designed to automatically adjust the tension based on cleanliness of the belt, load and general belt wear — all factors that affect belt tension. 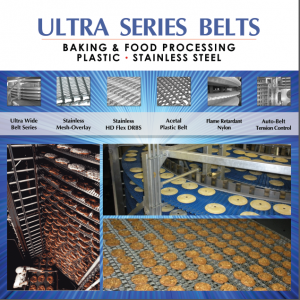 Results for the bakery are increased belt life, decreased dirt and decreased friction. 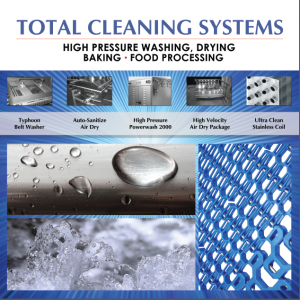 PLC- controlled air temperature, air velocity (fan speed) and cooling/freezing time (belt speed) insure uniform quality cheesecakes, while the fully welded, 10-gauge stainless steel floors improve sanitation and cleaning in the spiral coolers and blast freezers. As complex as it may seem, The Cheesecake Factory Bakery is the result of simple ideas: A devotion to quality and customer satisfaction, the right people to see the job through and a thorough enjoyment of creating indulgent, over-the-top delights.